Custom slip covers are very useful and important furnishing home equipment that allows to protect, visually improve and bring more comfort to the interior. At Universal Upholstering we can offer you the variety of quality materials of different color palettes and all textures starting from fabrics, vinyl to genuine leather. Contact us for a consultation and get free estimate! Our experts will provide you with all necessary information regarding custom slip covers for your furniture and give you the idea on how properly and, from design point of view, creatively make your custom slip covers an effective protection for your favorite furniture piece. CUSTOM ARMCHAIR RECLINER SLIP COVER: This particular recliner slip cover is made with durable fabric. Of course, the slip covers can also be made with a variety of different upholstery and slipcover fabrics. 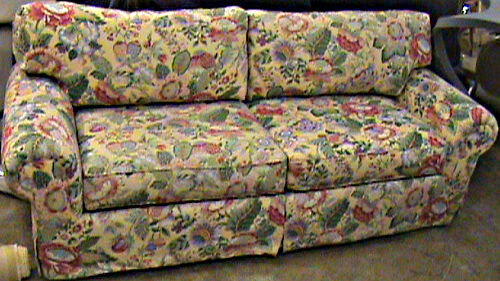 CUSTOM LOVESEAT SLIP COVER: Custom slip covers can be made for a variety of loveseats, sofas and other furniture. 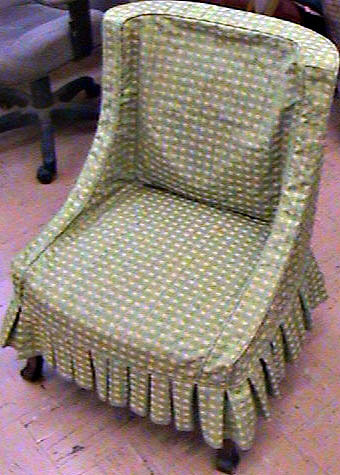 CUSTOM RECLINER CHAIR SLIP COVER: Another example of a custom slip cover. 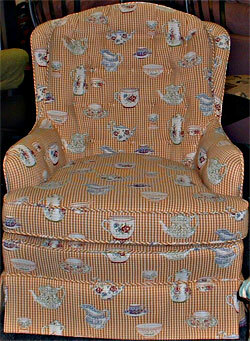 This one is a custom made slipcover for a recliner chair in a child's room. This slip cover is both easy to clean and colorful. CUSTOM MADE SOFA SLIPCOVERS: With a variety of custom furniture fabrics to choose from, a custom made sofa slipcover is just the thing to brighten up the room and make your old sofa look and feel like new. 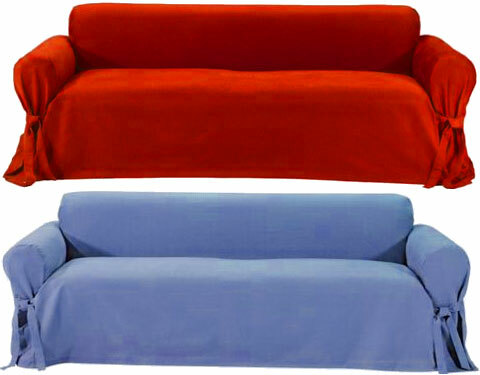 Many stain resistant fabrics are also available to make the sofa slip cover extra durable. Get custom slipcovers for your sofa and your chair, futon, loveseat, chase lounge, sectional, couch, recliner as well as other furniture, mattress and furniture cushion slip covers. CUSTOM MADE CHAIR SLIPCOVER - COMPLETED: Sometimes things like custom upholstery and custom made furniture can be out of your budget and/or out of your time schedule. If this is the case, a custom slip cover may be the answer to refreshing your old furniture. It's not quite as good as the classier more expensive alternatives, but quality custom slip covers with custom slip cover fabric picked to exacting specifications, are often better than the furniture which looks old, damaged, worm out, out of style and/or out of place. Custom slip covers can be made for chairs, sofas, love seats, chase lounges, sectionals, mattresses and just about any other kind of furniture.